There is something exciting about the drop of cards on a table. Players lined around the edge as the bottom layer of cards is placed. Then the dealer drops an Ace on top. As you check the lower card, you realize you have a blackjack! Blackjack is of course a popular card game played in online casinos. The reason is that players have better odds at blackjack than other games. But to truly win, players must understand the game. This guide is designed to help you gain a better understanding of the game. This begins with an important tip. You aren’t going to win every game you lay. But as you gain a better understanding of how the game is played, you’ll know how to improve your win/loss ratio. This does take some concentration, in addition to patience. Before you play, you need to understand the rules of the game. Blackjack features a 52 card deck that is shuffled. Each card is assigned with a value. Cards are assigned their face value from 2 – 10. Kings, Queens and Jacks are assigned a value of 10. The Ace is a 1 or 11, depending on the hand. Players must get their cards to total as close to 21 as possible, without exceeding the total. If a player is dealt a blackjack with two cards, most only casinos pay 3-2. The exception is if the dealer is also dealt a 21, then the hand is a push. However, if the dealer obtains a 21 after the first 2 cards, players that achieved a 21 on 2 cards still win. Most online games use four to eight decks that are regularly shuffled. This constant shuffling prevents cards from being counted. Players begin by placing their chips in the betting square and being dealt two cards. The first card is placed face down and only visible to the player. The second card is placed face up. Other players on the table are then dealt cards. The dealer is dealt last with the same setup. Players begin deciding on their play. The first is to hit. If you don’t believe your hand will exceed 21, ask the dealer to hit you. This gives you an additional card. If you are at a point where you’d like to hold your cards, you stand. No additional cards are given. Double Down is a bet that doubles the original bet. In this case, if you win, you’ve doubled your winnings. You are given one final required card and if it busts your total, you lose everything. Splits are done when you are dealt two cards of the same denomination. You then play out both hands as you normally would. Insurance occurs when the face up card is an Ace for the dealer. This is a bet that there is a 10 underneath the Ace. If the hand is a blackjack, players still walk away with money. If not gameplay resumes as normal. It is important to note that dealers must abide by specific rules. They must draw on any cards up to 16 and stand at any total 17 or more. On soft 17s with an Ace, the dealer may draw another time. To help you win, there are some basic gameplay tips. If your total cards are valued less than 8, always hit. Regardless of the dealer’s top card. When you have a 9, double down if the dealer’s top card is 3 – 6. If their card is higher, hit. 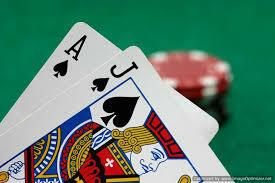 Hands valued at 10 should be hit if the table’s dealer has a top card that shows a 10 or ace as. For 2 through 9, double down. On an 11, double down for a 2 through a 10. If the card is an Ace hit. If your hand is worth 12 and the dealer shows a 2, 3, or 7 and higher hit. If their top card is a 4 – 6 stand. For hands 13 – 16 always hit on a 7 or above for the dealer’s top card. On a 2 – 6 always stand. Hands valued at 17+ should always result in a stand. Blackjack is one of the most exciting games you’ll have a chance to play. With many variations at your favorite online casino, you’ll easily find a variation you love. If you play blackjack online, you need to have this guide and play chart handy. It doesn’t matter if you are new to the game or you have been playing it for a very long time. You can have some bad habits that form, so by looking at this charge you can prevent them from getting the best of you. It can serve as a reminder to help you stay focused and to play in a manner that enhances your chances of winning. Some of the hands you get dealt in blackjack are so easy to think about what to do. Others though can be more of a challenge. For example, if you need to hit or stay and you only have a second to do so. The rule of always stand on 17 has often gone by the wayside and so you need to have other strategies to use too. What are the possible hands you can get when you play blackjack? There are quite a few of them! This handy chart though can show you every single possibility so you know what to prepare for. They can help you to bet and to help you with reducing errors as you play the game of blackjack. The game is one of chance, but there are certain moves in your favour as well as those that aren’t in your favour so be aware. You will have more confidence as you play online blackjack with this guide and play chart accessible. It is a type of cheat sheet that you can glance at for information to quickly make a decision during the game. Never split your 10s, always split Aces and 8s. It doesn’t matter what card the dealer happens to be showing. Never take insurance due to the advantage the house has when it comes to the overall odds. Stand on a hard 13, 14, 15, or 16 if the card the dealer shows is a 6 or lower. If the dealer shows a card that is a 7 or higher, you should hit. Stand on a hard 12 if the dealer is showing 4, 5, or 6. There is a very good chance the dealer will bust. Hit until you have 17 at least if the card the dealer is showing is a 10. Hit a soft 17 if you have an Ace and the dealer is showing a card of 10 or higher.